The term “dark social” was coined to describe social interactions that can’t be tracked and measured by traditional analytics, most notably instant messaging apps and social media messaging functions. For example, a brand may be able to track public conversations about its products or services on Facebook, but once a conversation moves to Facebook Messenger, it’s impossible to see what’s being said or shared. It’s the growth of instant messaging apps, specifically the meteoric rise of WhatsApp, that have played the biggest part in putting dark social on the agenda of marketers. With more than a billion users globally, WhatsApp is one of the world’s primary means of exchanging information and talking about brands. But brands themselves remain in the dark about what is being said. 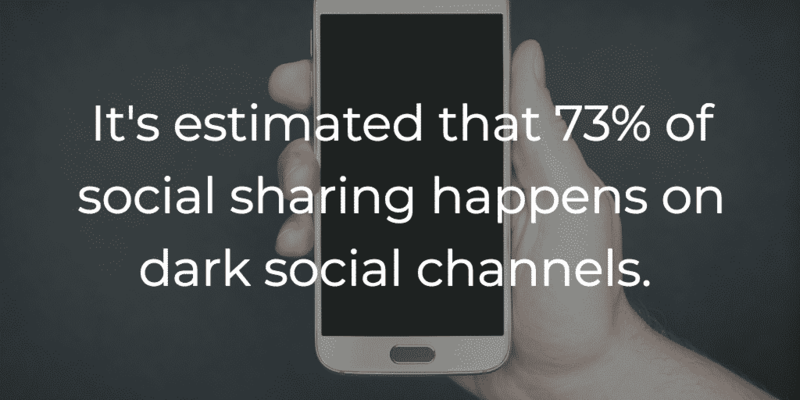 The implications of dark social are huge- it’s estimated that 73% of social sharing now happens on dark social channels. It can be tempting for brands to feel that, because they can’t easily engage with dark social, they should focus instead on other channels. But ignoring dark social risks discarding a valuable opportunity to engage with customers. In the past years, a handful of innovative brands have woken up to this opportunity and have begun to pioneer creative strategies for tapping into dark social’s potential. By their very nature, dark social channels are a personalized and self-selecting community. This presents a challenge for brands locked on the outside, but offers a competitive advantage for those that are able to access conversations from the inside. Adidas is one brand that has been particularly successful with a smart and innovative dark social strategy. In 2017, the brand launched ‘Tango Squads,’ which are groups of incredibly well-connected football obsessives living in fifteen major cities worldwide. For these groups of influencers, Adidas creates exclusive, mobile-optimized content, often sharing new products with them before the official launch on the Adidas website. These influencers then push out the content Adidas shares to their networks, landing a large number of mentions on dark social platforms in the process. The focus is on giving influencers access to content that inspires them, and letting them do the rest. Contact is light touch, but meaningful. Another example of a brand jumping on the dark social bandwagon saw Greggs Bakery creating a VIP WhatsApp group – Festive Bake Lovers – for 250 customers who wanted exclusive information on new launches before they were formally announced. When creating a presence on dark social channels, it’s important for brands to remember that they’re encroaching on a private, less formal forum: re-using creative and messages from other campaigns risks being perceived as out of touch and irrelevant. Too many brands see the opening up of a new channel of communication as a way to broadcast messages. Dark social channels like Facebook Messenger or WhatsApp aren’t a publishing platform. They’re a way for a brand to spark a conversation.Deploying interactive content that has a life beyond the initial share will have a long tail value and create momentum. Dark social activity can’t be monitored in the usual ways, so brands need to rethink how to measure campaign success. For example, dark social is never going to deliver huge numbers in terms of reach, but if marketers are able to harness the social currency of influencers, they could find their content reaching a new, more receptive audience. Consumers today are hyper-attuned to sales jargon and obtrusive ads. While they may accept this in other channels, the insular, community-led feel on dark social channels means brands need to have a reason for being there, beyond a sales pitch. Bringing together a team of users to form a new community, offering exclusive previews of products and services, and giving behind the scenes access are all ways a brand can show that they’re adding value. Above all, if marketers are going to bring dark social into the light, they need to focus on tapping into peoples’ passions in a personal but sensitive way and demonstrate that they understand who their audience is and why they’re using these platforms.